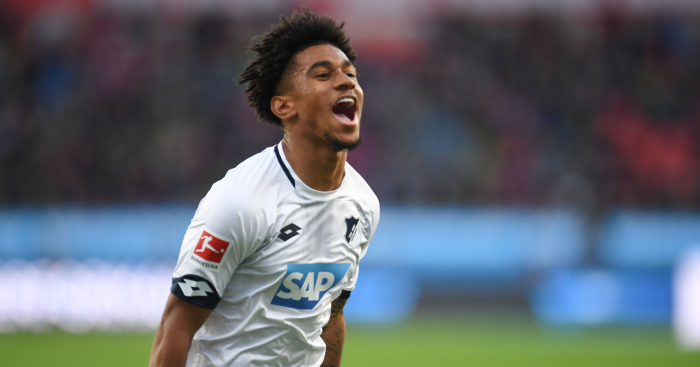 Reiss Nelson continued his excellent form on loan at Hoffenheim with a stunning goal to open the scoring in a 4-1 victory over Bayer Leverkusen. Nelson joined the Bundesliga outfit on a season-long loan deal in the summer and has now scored five goals in six league appearances at a rate of one every 63.8 minutes. The 18-year-old is one of a number of young Englishmen impressing in Germany’s top flight and his performances will no doubt have caught the eye of Gunners boss Unai Emery. Nelson’s latest effort came in Hoffenheim’s 4-1 triumph at Bayer Leverkusen with a goal Thierry Henry would have been proud of.